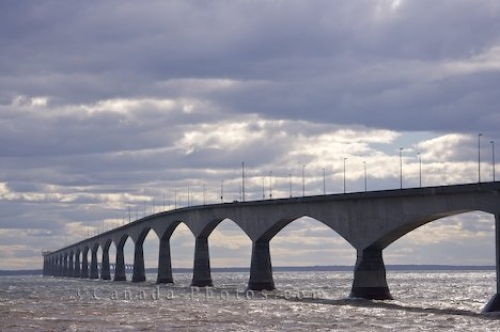 The Northumberland Strait swirls around the concrete spans of the Confederation Bridge that crosses between Prince Edward Island and New Brunswick. Crossing between New Brunswick and Prince Edward Island over the Northumberland Strait has become much simpler since the official opening of the Confederation Bridge in 1997. Cars pay a toll to cross the bridge and cyclists and pedestrians are forbidden to cross this nine mile long bridge and must make use of the shuttle bus provided if needing to cross. Picture of the Confederation Bridge as seen from Borden-Carleton in Queens, Prince Edward Island in Canada.